QueView automatically routes inbound emails into customized queues based on specific topics, such as support, sales, general questions, etc. Instead of pushing emails to an individual agent who may not be trained (or available) to handle a topic, the emails go into queues where available agents can choose which emails they wish to respond to, based on priority, time-sensitivity, topic or any other criteria. Answer emails rapidly with greater accuracy — closing cases faster and freeing agent time for other tasks. Assign emails to other agents or queues if more expertise is needed. Choose emails to respond to, focusing on SLA adherence, agent expertise, area of specialty, etc. Create multiple queues based on any set of criteria, such as keyword, subject line, date, recipient or sender. Agents can search queues or emails based on topic, sender, subject, specific words, etc. Agents can assign emails to themselves based on any number of criteria. 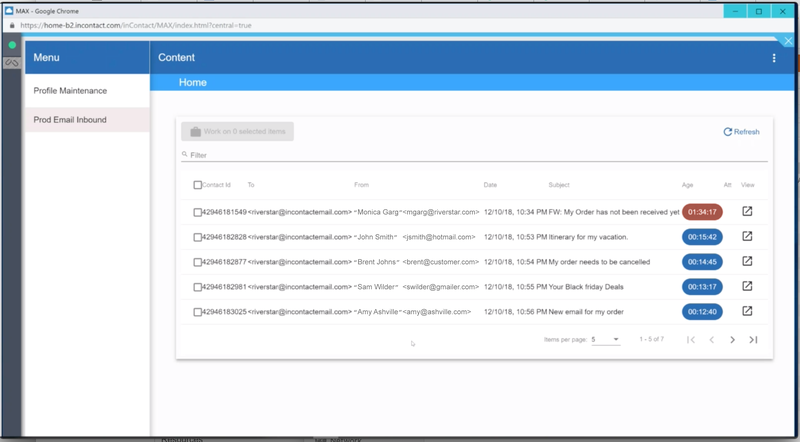 An intuitive checkbox interface allows multiple emails to be assigned at once. Supervisors can assign emails from any queue to a variety of agents. Multiple agents can utilize the application concurrently. Users can preview emails and assign them to agents directly from the preview. Download the RiverStar QueView Datasheet for A Full Features and Benefits Overview.